GAHS junior Morgan Stanley (4) attempts to avoid a tag at home during the Blue Devils’ 2-1 win over Rock Hill on Monday night in Centenary, Ohio. CENTENARY, Ohio — Runs came at a premium and strikeouts were supplied by the dozen. 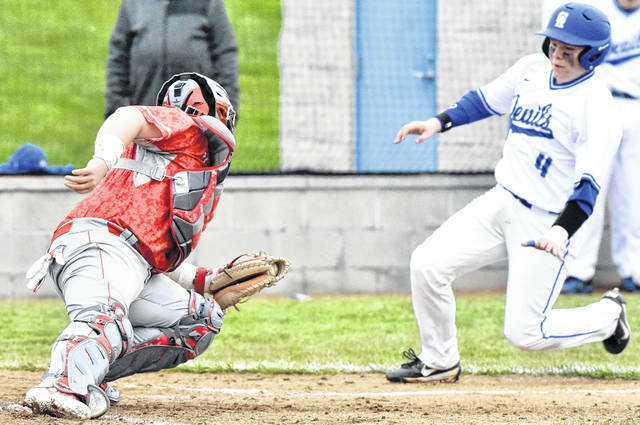 The Gallia Academy baseball team provided the necessary run support to compliment a dominant pitching performance on Monday night during 2-1 victory over visiting Rock Hill in an Ohio Valley Conference contest in Gallia County. The Blue Devils (3-2, 2-1 OVC) scored a run in the bottom of the first inning, as Dylan Smith led off with a single and stole second base. Smith scored on an error at shortstop off of the bat of Morgan Stanley with two outs to put the Blue and White ahead 1-0. GAHS tacked on its second run of the contest in the bottom of the fourth frame, as Josh Faro started off the inning with a single and moved into scoring position by way of a steal. Stanley reached on a walk with two outs and Cole Davis followed with a run producing single to drive in Faro, as the Blue Devils extended their lead to 2-0. Rock Hill (6-1, 4-1) cut the deficit to 2-1 in the top of the fifth inning when Landon Smith reached on a single with one out before advancing to third when Braydon Friend followed by reaching on an error. Smith later scored on a wild pitch to cut the Blue Devils’ lead to one run. The Redmen produced just one baserunner in the game’s final two innings of play, as Faro struck out four of the next six Rock Hill batters he faced to close out the one-run victory. 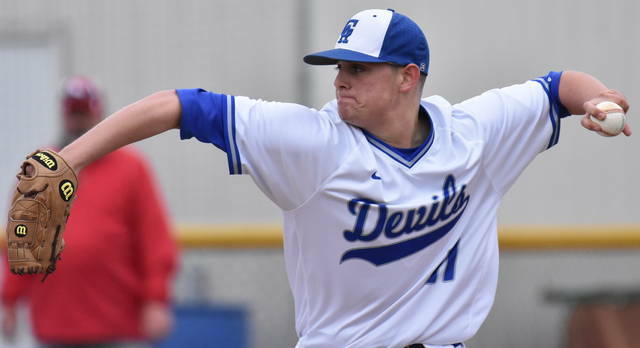 Faro earned a complete game victory for the Blue and White, as he allowed just one earned run on three hits and struck out 12 in seven innings of work. Faro also had one safety and scored a run in the game. 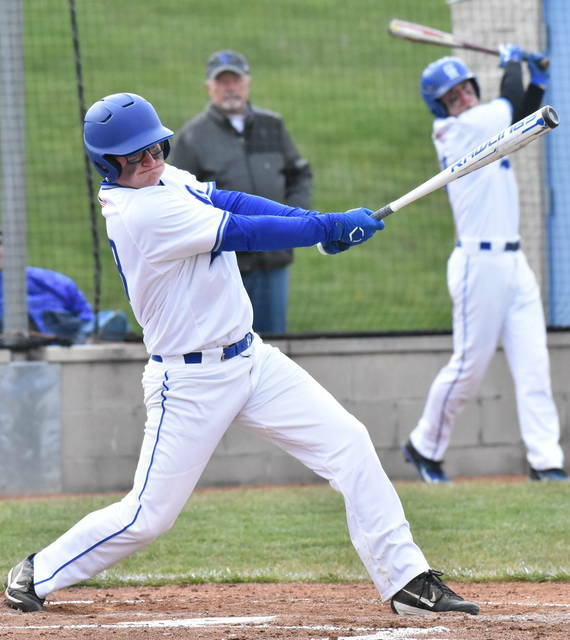 Braden Simms, Dylan Smith and Davis each had one hit apiece for the Blue Devils. Smith also scored and run, while Davis provided the hosts’ lone RBI in the contest. Cody Lewis was straddled with the loss for RHHS, as he surrendered two runs on four hits and allowed two walks over six innings. Lewis also collected five strikeouts in the contest. Lewis also provided one hit at the plate for the Redmen. Kaden France and Ladon Smith provided one safety each for Rock Hill. The Blue Devils left six runners on base in the contest, while the visitors stranded four. The Redmen also committed two errors, while the hosts had four fielding miscues. Following the game, Gallia Academy head coach Rich Corvin was pleased with his team’s effort — particularly due to the games importance in relation to conference standings. “As always, in my opinion, Rock Hill is the team to beat in this conference,” said Corvin. “They were undefeated coming into tonight. We faced one of the top pitchers in the conference in this game. I told our my team yesterday, it was going to be a 2-1 or 1-0 game. So we knew we had to get Faro at least one or two runs to win, which obviously we did. Gallia Academy returned to action on Tuesday, as they hosted Point Pleasant, before traveling for a rematch with the Redmen on Wednesday in Lawrence County.